Yeah, thanks a lot, Will Wright. Now can you breed a new us that’s immune to procrastinating the rest of our lives to play your game? 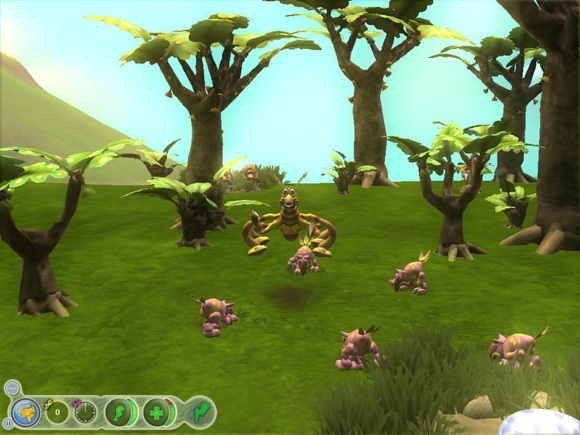 Just when we thought we might escape Will Wright’s upcoming PC game, Spore, and get some work done, it turns into a compositional must-have. Regine Debatty, who gets to hang out at hip, artsy European events like the 01 Award reception at the University of the Arts Berlin, therefore got to blog Brian Eno’s speech. It loses a little something in the translation (like, I wish I had just been in Berlin), but it’s all worth a read. The big news: Eno will create a fully procedural sound score for Spore, to make the music as generative as the game itself. My prediction: the results will be brilliant, and will interactively generate a distortion in the space-time field around our computers in which we cease to productive for long evenings after the game is released. Generative, indeed. Of course, you don’t have to be a game composer to integrate generative music into your work. Ableton Live Follow Actions can be chained into extensive algorithmic patterns, so that you can play against a more random background. Custom patches in software like Reaktor and Max/MSP can take you much further, whether controlling audio, MIDI, or some other element; they can respond to your playing or provide interactive control or have a mind all their own. There was a time when I think “linear” composers butted heads with “algorithmic” composers, the latter so slavishly dedicated to their field that they sometimes created work that felt a little too generative to everyone else. Now, you can look at all these methods as a way to break up timelines anywhere you like to keep your creative juices flowing — even if you generally work in a more linear way. And, of course, the very idea of “scoring” as it existed in film can now be expanded. Working with algorithmic and generative music? Let us know about your projects. And do it quick, before we’re all playing Spore instead of making music. The summary page appears to be broken at the moment.